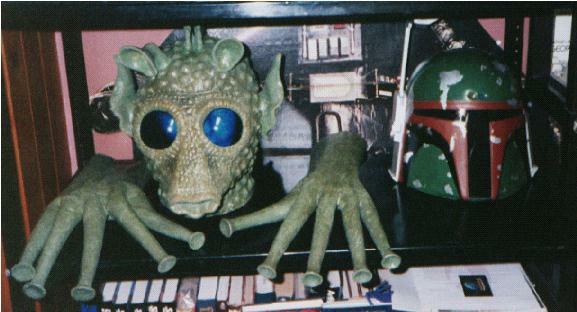 Greedo and Boba Fett Helmets: The Greedo mask is a full head mask made of a heavy rubber material. The eyes are large and clear to allow you to actually see when you walk, and you breath through the mouth. There are air holes under the chin to help keep you cool as it is a very hot mask to wear. The hands are full size and fit well allowing you to use them with a blaster (and the fingers stick out of a trigger guard just like in the movie! ). Boba Fett was made by Marco Enterprises and is a very heavy plastic-resin material. The lense is one large piece for easy visibility. The targeting device does swivel down and has a small picture of Luke and the other on the Sand Skiff. Surprisingly the sight is made of wood!